On this trip I was flying in the American Airlines 777-300ER Premium Economy cabin between London and Los Angeles and, even though this was only a daytime flight, at over 10 hours in length it would prove to be a good test of what American Airlines’ offering is like. 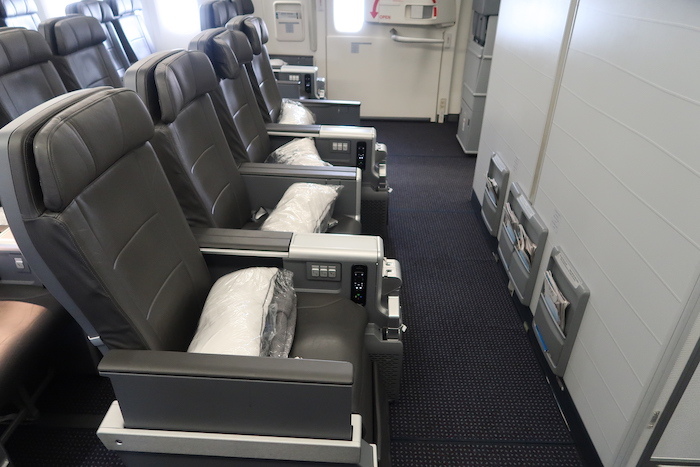 The American Airlines 777-300ER Premium Economy cabin offers 28 seats set out in a 2-4-2 layout for three rows and a row with just 4 seats in the centre (the center seats don’t all line up with the seats on either side of the aircraft). 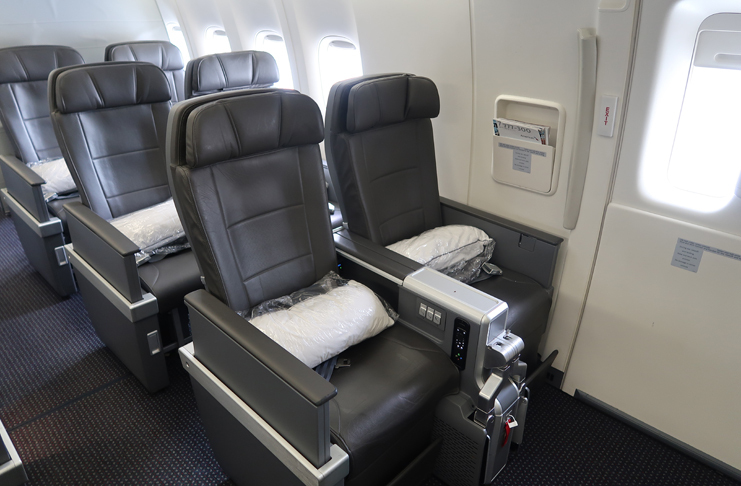 The two pairs of exit row seats on either side of the aircraft (row 16) offer a fantastic amount of legroom and, because of the way the seat is designed, they’re no narrower than the other Premium Economy seats even though the in-flight entertainment screens are built into the armrests. The four seats in the exit row and in the center of the cabin also have good legroom…. 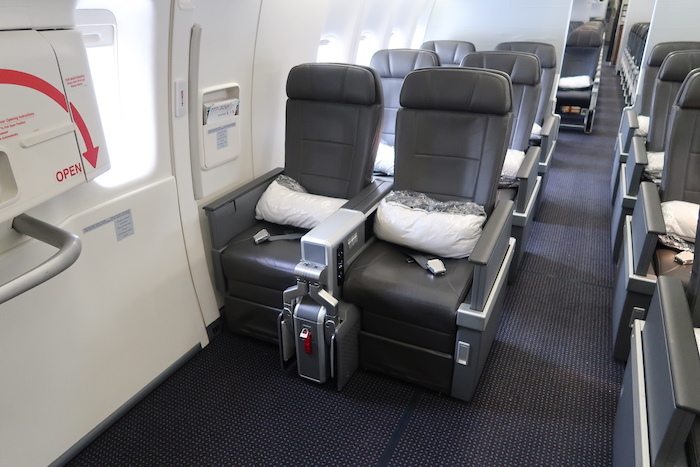 The regular Premium Economy Seats look like this…..
….and these offer a small foot rest that’s stowed under the seat in front. For this trip I had deliberately selected a regular Premium Economy seat as those are more representative of the Premium Economy experience most people will have. 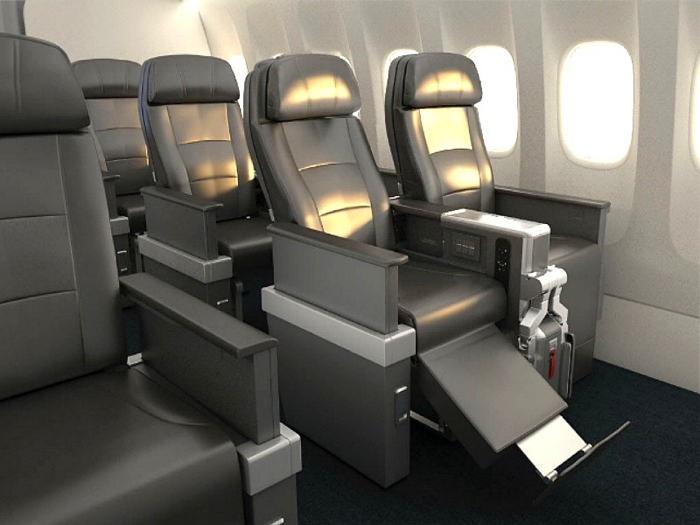 The American Airlines 777-300ER Premium Economy seats are 19” wide and, with the exception of the exit row, they all offer 38″of seat pitch (the closest equivalent to legroom). The IFE remote control is built into the center armrest….. The armrest cover lifts up to offer easy access to the storage area and, inside here, is where the headphone sockets and universal power outlet are to be found. The tray table is deployed by pressing on a silver button under the armrest cover and opens up in to a small drinks table…..
….or a larger table capable of holding a 15” MacBook. With the tray table stowed in the armrest the seatback ahead of you is taken up with the IFE touchscreen, a fixed magazine rack and a small pouch. As far as storage goes the regular Premium Economy seats are ok – the pouch will just about hold most personal electronic devices (although not many at one time) and the storage area under the center armrest is more than adequate for storing small handheld devices, books (as long as they’re not too thick), cables and other small items….and there’s always the area under the seat ahead where you can store a small bag. Things are slightly different if you’re seated in one of the exit rows as there’s no storage pouch and there’s nowhere secure to store a small bag because there’s no seat ahead of you. What you gain in legroom you lose in storage space. I was sitting in 17J on this flight and this is the aisle seat in the pair of seats on the starboard side of the aircraft. The leg room at my seat was fine but, because of the way the seats have been fitted to the aircraft floor, there’s a vertical bar under the seat ahead which gets in the way (a bit) if you want to stretch out your legs directly ahead of you – you have to angle your legs towards the middle of the seats ahead of you. The window seat didn’t appear to offer a similar problem and, on the whole, this shouldn’t cause too many issues….but, if you or the person seated next to you want to use the under seat area to store a bag of any size, you may find the space for your feet is slightly restricted. Overall the seat is comfortable and not a bad place to spend a daytime transatlantic flight (I’ll be testing out the Premium Economy cabin overnight later this year). The legroom is ample, there’s just about enough seat width so you don’t feel too constrained (caveat – I say that as someone who isn’t particularly wide) and the foot rest is a nice little extra. It will be interesting to see just how easy it will be to get some sleep in this seat on an overnight flight but, regardless of how that test turns out, compared to the American Airlines 777-300ER Economy Class cabin this is a noticeable step up and offers a considerably better flight experience. There were two clear plastic bags waiting for me on my seat when I boarded. One contained a blanket and the other a pillow – both with Casper labels. The pillow was a good size and, although smaller than the pillows in American Airlines Business Class, they’re comparable in density to the Business Class pillows and they’re considerably better than what you’ll be offered in American Airlines Economy Class. The blanket was also a good size and think enough to keep me warm during the flight….which was just as well because the cabin was cold enough to keep most Arctic animals happy. The storage area under the central armrest was home to the over-ear headphones that American Airlines provides. These headphones come with a single-prong input (which I found strange considering the headphone socket is designed to take a triple-pronged input) but they still offered stereo sound when plugged in. This is good news as it means that all personal headphones and ear buds should be able to offer stereo sound without the need for an adapter. As far as the headphones go that’s where the good news ended – they were abysmal. 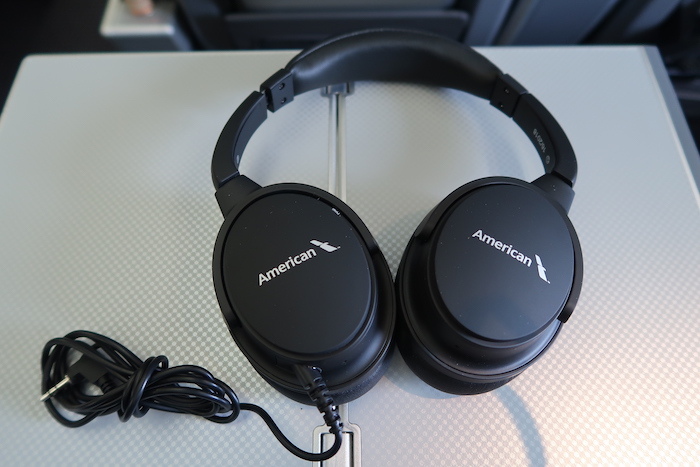 Just as you should never rely on an airline to keep you entertained in the sky (bring your own movies, TV shows and music pre-loaded on your devices) you should also never rely on an airline to supply you with good quality headphones. Alongside the headphones was a small, plastic, blue amenity kit bag…. The dental kit contained a toothbrush and a small tube of toothpaste while the “refreshing travel kit” contained body lotion and lip balm by C.O. Bigelow. Also within the amenity kit were a couple of vouchers offering discounts at CO Bigelow and Casper. The air vents/nozzles will come in useful on occasions when the crew set the cabin temperature a little too high although, as I’ve already mentioned, it was so cold in the cabin on this flight that these were surplus to requirements. For a Premium Economy Cabin the amenities aren’t bad. You get an amenity kit with the important essentials in it (a lot of Business Class amenity kits have too many things that people simply don’t need) and the blanket and pillow were fine (although they’ll get a more thorough test when I fly in this cabin overnight). The one noticeable negative was the headphones – they were truly terrible. Overall it’s hard to find too much wrong with what’s on offer for a daytime flight. The IFE screens are a good size on which to watch movies and TV shows…. …and although you can use the remote control to navigate the entertainment menus…. …..the touchscreen functionality works well enough that you don’t really need the remote control. American generally offers a pretty good entertainment selection onboard its long-haul flights with latest movie releases…. ….a good selection of TV shows (although there are only a few episodes of each show so don’t expect too many box sets)…. …a varied selection of music…. ….and a few games that can be played via the remote control. ….but I have yet to get these to work on any of the transatlantic flights on which I’ve attempted to watch them….perhaps I’m just unlucky. The only real annoyance with the inflight entertainment was that some programming was preceded by a series of commercials that dragged on and the couldn’t be fast-forwarded. By the 3rdor 4thtime I had sat through the same adverts I was prepared to boycott Marriott and everyone else who was paying to interrupt my viewing! For a while I thought there was something wrong with the aircraft’s wi-fi as my MacBook wouldn’t connect…. ….but I could see other passengers in the cabin working on their laptops and I managed to access the wi-fi through my iPhone so I think this was an issue with my hardware and not the Panasonic wi-fi. Sadly this means I can’t really tell you how good or bad the wi-fi was if you need to do some serious work but, for basic messaging, emailing and light surfing on an iPhone it seemed ok. The entertainment on offer is perfectly acceptable…I just wish American offered a few more full series box sets of the more popular shows. I can’t really comment on the wi-fi on this flight as I didn’t get to give it a proper test but, based on previous experiences with American’s transatlantic wi-fi, I suggest that you should expect a very hit and miss service. We took off from London Heathrow at 13:10 and just 10 minutes later a flight attendant came around with bottles of water. 15 minutes after take-off a rather harried-looking flight attendant handed out bags of mini pretzels…..
…and 25 minutes after take-off the drinks cart was brought around offering complimentary hot drinks (tea/coffee), wine, beer and sodas. I didn’t see any spirits/liquor in the cart but they may well have been bottle in there. My coffee was served in a paper cup…..
….and the wine was served in the same style plastic glasses that are usually used to serve water and sodas. Around 55 minutes after take-off the drinks trolleys reappeared again and this surprised me until I saw the food carts appear too. The flight attendant was equipped with a tablet which correctly told her that I had ordered the prawns with wild rice. The meal all came on one tray and it was served on china with proper cutlery and a good-sized cloth napkin. The main course was not really hot enough but it tasted ok. Not great, just ok. The salad tasted very fresh and was one of the better salads I’ve had on American Airlines – this probably had a lot to do with the fact that the airline used lettuce rather than arugula as the base ingredient. I didn’t try the bread roll, the crackers or the soft cheese but I’ve had them all before and they’re definitely nothing to get excited about. The cheesecake looked very synthetic but it didn’t actually taste too bad. Overall the meal was ok – there wasn’t much of the main course but the general quality was acceptable. Almost exactly 5 hours after take-off the flight attendants came through the cabin to offer ice cream (only one flavor available)….. The crew served the second meal (for which there was no choice) and more drinks approximately 9 hours into the 10.5 hour flight. The ingredients worked well together and the good news continued with the melon salad which was also very good. Lastly there was a chocolate salted caramel dessert (of the type that BA used to serve…and may still serve). That wasn’t a bad ending to what turned out to be a pretty good meal and, almost as importantly, the crew were very prompt when it came to clearing away the trays. Overall the level of service on this flight was good if unspectacular. The crew seemed flustered and harried at the beginning of the flight but they got into their stride pretty quickly and, after that, were mostly pleasant and polite. The meal services were efficient and there were no long delays between meals ending and the trays being taken away – I consider that a big positive. The service was definitely a step up from Economy Class (not that this is a big hurdle to clear) but it was still a distance off what I’d expect if I had been in the Business Class cabin. There wasn’t a great selection of food but what was served was edible and, in the case of the salads, pretty good. The entrée for the main meal wasn’t particularly filling and it really needed to be hotter but thats probably the limit of the criticism I can muster for the food. It was disappointing to see wine served in plastic soda cups (it looks incredibly cheap) and it would have been nice to have a china cup/mug for coffee – if Virgin Atlantic can offer glasses and china mugs why can’t American? Overall the offering was reasonable and the crew were fine so I’d give the food and service a passing grade…but nothing much more than that. “Adequate” is probably a word that sums up the overall experience well. I didn’t come away from the American Airlines Economy Class experience blown away or wondering why I don’t purchase it more often but I did get off the aircraft in good shape and the flight was perfectly ok. If you’re looking for a cheaper alternative to Business Class I think you may be disappointed (there’s a huge gulf between the Business Class seat and the Premium Economy seat) but if you’re looking to pay a little more to escape the horror that can be transatlantic Economy Class then this is well worth considering. Overall the name of the cabin really says it all – this is not “Business Class Lite” but this is very definitely “Premium Economy”.